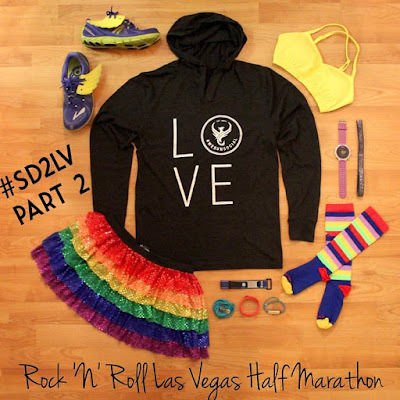 The Rock 'N' Roll Las Vegas Half Marathon was the second race of our #SD2LV adventure. If you didn't read about the first half marathon that we ran earlier Sunday morning, make sure to check out the Silver Strand Half Marathon Race Recap. When we last left off, Brian, David and I had gotten on our flight to Las Vegas. 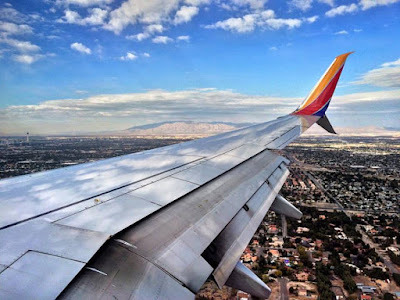 The flight was pretty uneventful (other than David getting a billion and a half bags of pretzels from one of the flight attendants and us laughing at Brian's fashion statement #GetOffMyLawn). Brian's wife was meeting him in Vegas. Her flight got delayed coming out of the Bay Area, so instead of her getting in before us, we all landed about the same time. We met her by baggage claim, said our hellos and then jumped in a cab to head to the Strip. 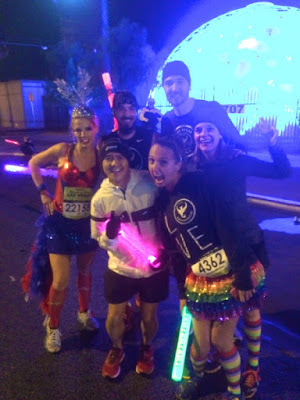 I was going to be staying with some of my BRF (Best Running Friends) at Treasure Island that night. The issue was, although it was close to the finish line, it was at the other end of the Strip from the starting line. Since it would have been cutting it a bit too close to walk down to the hotel and then back to the start, I opted to hang out with David, catch up on social media and watch some football before heading to the pre-race festival. Detroit native Kid Rock was the headliner at the pre-race festival. Let's be real, I actually would have preferred Matt & Kim who performed before the 5K the night before (or Macklemore and Ryan Lewis who did last year's event), but I guess Kid Rock is more "rock 'n' roll" (or at least has the word rock in his name ;)). Because we were in San Diego until a few hours before the race, we were unable to go to the Expo to pick up our bibs. Thankfully Rock 'N' Roll had a same day race bib pick-up option available (just meant we needed to get to the pre-race festival a little earlier so we could grab everything we needed). I totally understand the desire for everyone to go to the Expo, but am super thankful there was an alternative option for folks who were crazy enough to turn this race into another leg of a challenge. 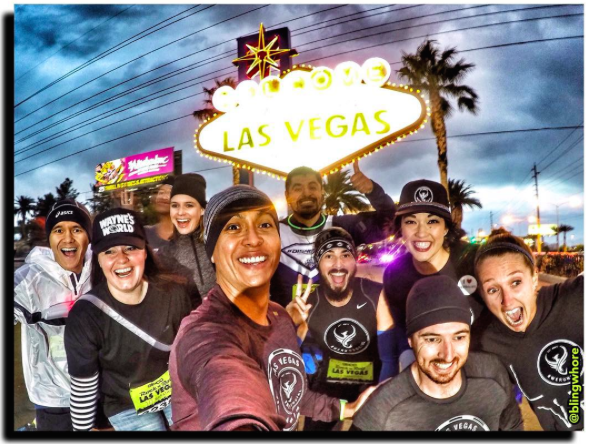 Even with there being tons and tons of runners around (I heard that Las Vegas rivals San Diego as the largest of the Rock 'N' Roll races with something crazy like 45,000 registered runners), we were still able to meet up with a big chunk of our crew before heading to the starting line. socks and me saying something along the lines of "Ohhhhh boo hoo"
I mean, when the crew rocks BANGIN' socks, you've GOTTA document it! After hugs, pictures and more laughs, it was time to head over to the starting line. We could already tell the wind was going to be howling for the race (they were expecting 40-50mph winds with gusts upwards of 60mph) and it looked like the ominous clouds were starting to roll in. 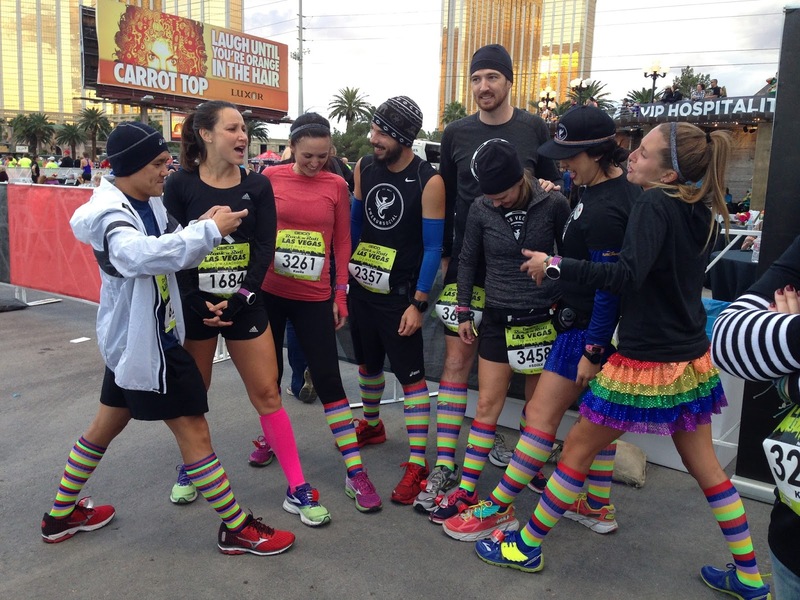 It's always a party with the We Run Social crew! Yay for pre-race selfies! And people with long hands arms! I heard there was something crazy like 48 corrals for this race (I told you it was HUGE), but thankfully we were up in the front and were able to start within a minute or two of the official start of the race. So the plan for this race was to take it slow, steady and have a BLAST along the way. We would stop for selfies, walk through water stops (and whenever anyone needed an extra little break), dance through the streets, take glow sticks from volunteers for our moving rave party and end up being "those runners" who were ignoring all running etiquette because we were too busy having fun to realize there were 44,990 runners around us. A buffalo at the water stop?! Heck yes for character photos! What a relief to not be running this race for time... Seeing as the elements were NOT in our favor! We ended up having some pretty cray-cray weather out on the course. At times we were running into the 50mph wind, skating on the slick roads from the rain and shivering from the 40* temps. But don't let that fool you, we still made the best of it! Thanks for finding us out there Jen! 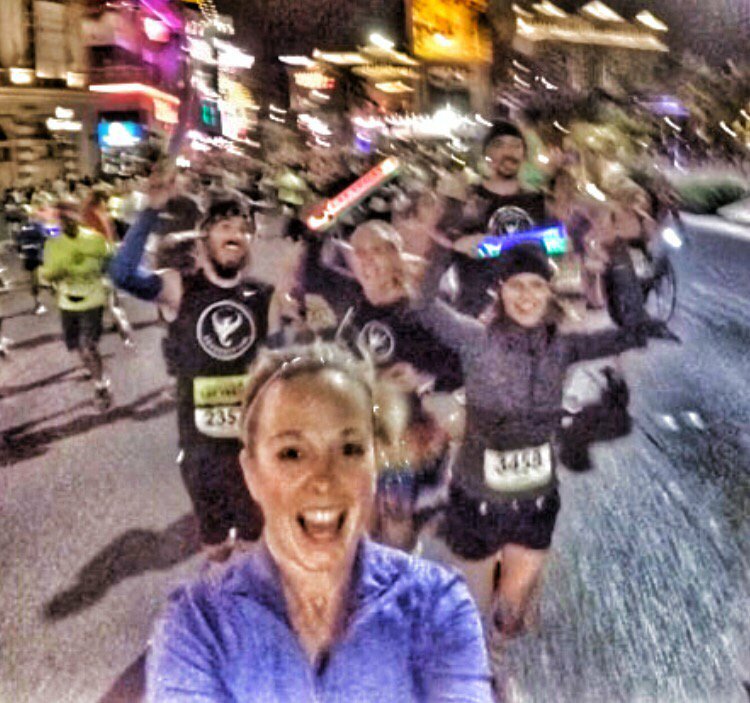 Although I'm not a Vegas person (I'm frugal, so $25 drinks and losing money is NOT my jam), it was still amazing to be able to run down the Strip. Running it at night gives you A TON to look at! The lights are just so bright. And they only shut the Strip down twice a year (once for New Years Eve and once for this race), so you gotta take advantage of the traffic-free streets when you can! doing it WRONG! Thanks for finding us out there Suzy! After we snapped a selfie with Chris Heuisler Elvis (who gave me a shout out when we ran by him around mile 4 and called me "Carlee McDooooooooooooot"), we crossed the finish line. Even though we were doing a bit of run/walk, we were still moving on the course. Once we finished you sort of come to a stop and get cold QUICKLY! Thankfully we were given some Mylar blankets and a ton of other goodies (but since my fingers were quickly numbing I really only grabbed a bottle of water and banana). 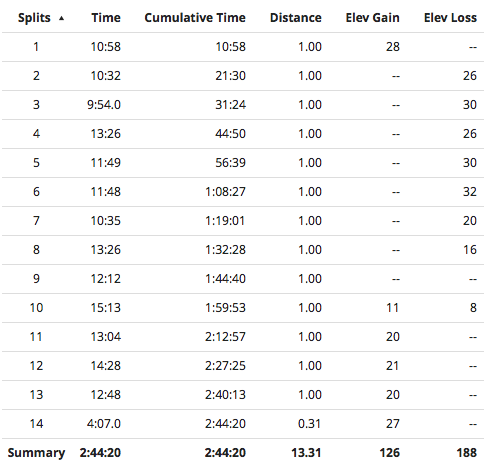 We ended up finishing with a sub-2:45 half time. And even though it was my second half marathon of the day, I felt better than I did during the first (but that's probably because we had a slower pace). Folks that had done this race before warned me of the long finisher shoot and making sure to pack something warm in your gear check because you can get chilly on your walk back to the hotel. Since I hadn't gone to my hotel before the race I actually had ALL my gear at gear check so was able to pull out a sweatshirt once we made our way to get our stuff (but this is definitely something to keep in mind for other folks who may not be staying super close to the finish line). 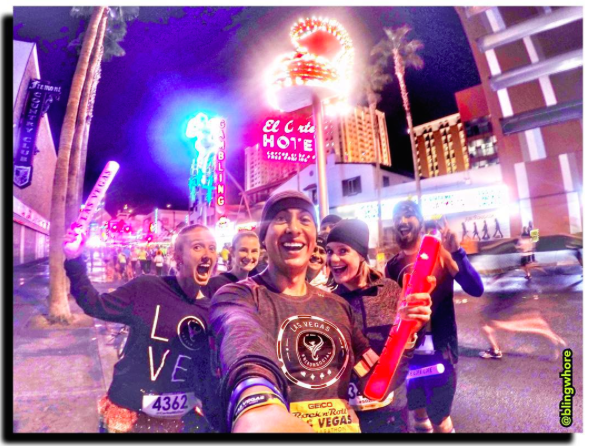 By the time we got back to our hotel it was after 8pm (which doesn't sound crazy late, but for someone who was up before 3:30am and had ran two half marathons in two states, it could have been midnight and I wouldn't have known any different). The ladies and I all showered and grabbed a quick dinner before crashing in bed. 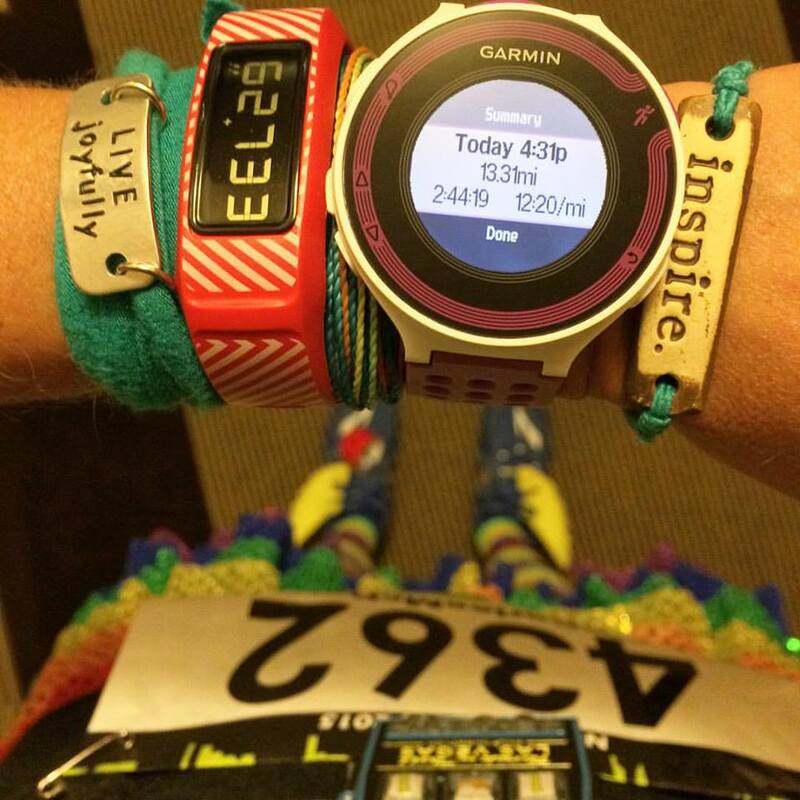 Have you ever run two races in a single day before? That was such a fun race! I was pretty bad during this race for being "that" runner too when I wanted to stop and take pictures. I wasn't always following my usual etiquette. How fun!! Great pictures!! I'd love to know your thoughts on the Garmin VivoFit vs. the FitBit??? thanks for posting this awesome recap! I am thinking about doing avengers and vegas in one day and you guys make it look so fun! I hate everything about Vegas, but I am DYING to run this race! Next year I'm skipping Avengers and considering this one. So great to see you out there, albeit brief. So bummed I didn't get the chance to hang out with you guys!